The Yampa Valley Stream Improvement Charitable Trust (YVSICT) in association with the Yampa Valley Fly Fishers (YVFF) invite you to beautiful Steamboat Springs and the Yampa Valley to join a three day fund raising tournament. YVSICT and YVFF are 501(c)3 charitable organizations benefiting the improvement and preservation of cold water fisheries in the Yampa Valley of Northwest Colorado since 1982. 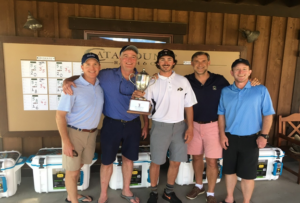 The annual Golf Trout Tournament begins Friday evening with registration, cocktail reception and buffet dinner hosted at the Catamount Ranch and Club. Following dinner, there will be bidding on public and private water for Saturday’s fishing event. Teams will be paired with their guide to determine equipment needs and fishing strategies for the next day. Saturday begins with an entire day of fully guided fly fishing on some of the finest trout waters in Northwest Colorado. Teams will be scored for the most trout, biggest trout (smallest trout! ), most species and for completing such tasks as catching a trout on a dry fly, nymph, and streamer. The day closes with teams, guides, spouses and special guests assembling at Three Peaks Grill for libations, dinner and recapping of the fishing portion of the tournament. Everyone will have a chance to purchase raffle tickets and join in a silent auction to win prizes from a selection of fishing/golf/outdoor gear, art and certificates for dining, lodging and travel. On Sunday, the teams and their guides will meet at the world class Tom Weiskopf championship golf course at Catamount Ranch and Club. Golf is of the shotgun start, best ball format with all the traditional “opportunities” to make or lose money along the way. Mulligans will be available all three days until tee time. The weekend events conclude with the award and prize presentations. Registration for the entire weekend is $800.00 per person or $3,200.00 for a team of four. Your donation includes the Friday buffet, Saturday dinner, Sunday coffee service and lunch, guide fees, rod fees, green fees, swag, and a hell of a lot of fun. So sign me up already ! !